we've mentioned before that we are pancake fanatics. we don't just love traditional pancakes, we also love baked puffed pancakes too. dutch babies somewhat fall in the general category of pancakes (although they more closely resemble puffed pancakes than traditional pancakes). dutch babies come together so easily with just a few simple ingredients, and you don't even have to stand in front of the stove to flip them like you would with traditional pancakes. you just pour the batter into a hot cast iron skillet and put the skillet in the oven. brilliant. you won't find any baking powder or baking soda in this dutch baby, just whipped eggs. those whipped eggs give the dutch baby a light and tender consistency. 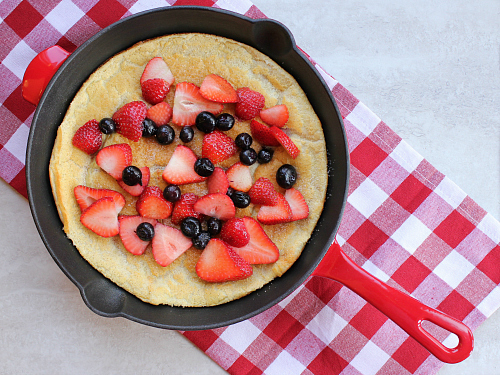 the cast iron skillet gives the outsides of the dutch baby a slight crunch too. so good! there's no need for maple syrup either. a combination of cinnamon and sugar along with fresh berries is the perfect topping for this dutch baby. 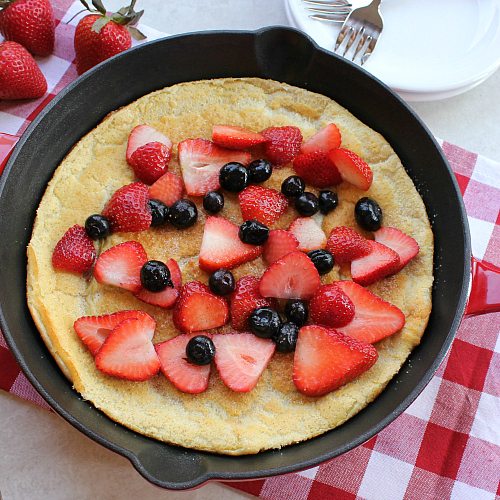 a warm dutch baby fresh out of the oven with cinnamon sugar and fresh berries . . . that's what breakfast is all about! preheat your oven to 425 degrees F. beat the eggs with an electric hand mixer on medium-high speed for 3 minutes, until pale and frothy. beat in the milk, flour, and cinnamon until completely combined. the batter will be very thin. place a 10-inch cast iron skillet on the stove over medium heat. melt the butter in the skillet and spread the melted butter evenly around the bottom and the sides of the skillet. remove the skillet from the heat and pour the batter into the skillet. place the skillet in the oven, and bake for 18-20 minutes, until puffed and golden brown. while the dutch baby bakes, mix the sugar and cinnamon together for the topping. slice the fresh berries, and toss the berries with a few spoonfuls of the cinnamon-sugar mixture. 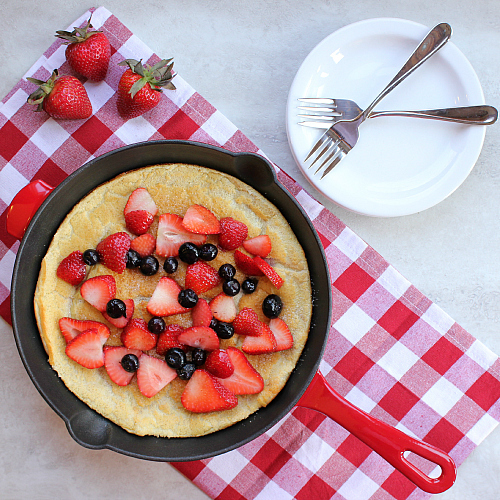 once baked, serve the dutch baby hot from the oven, sprinkled with cinnamon sugar, and topped with fresh berries. This looks really good and I love the photos, especially the first one. It looks like a photo that would be found in a magazine! Really looks delicious, especially with the berries.